Take a look at this Gorgeous ONE OWNER 2007 Mercedes-Benz CLK 350 Coupe. The CLK 350 Offers sporty performance, elegant design, and interior luxury. This Truly is a beautiful car, incredibly well cared for. Driving it was simply a pleasure. The CLK is among the best of its class, a rolling statement of style and taste powered by a 3.5-liter V6, which develops 268 horsepower and 258 pound-feet of torque. This Luxury Coupe is RWD and comes equipped 7-Speed TouchShift Automatic. The rear windows lower completely below the sill, emphasizing the smooth, open flow, beauty in symmetry. Mercedes does not let you down in the safety department, either. Safety features include multi-stage front-impact airbags, front passenger side-impact airbags that protect the torso, and curtain-style head protection airbags for both front and rear passengers. One of the really cool features, when front passengers close the doors, an electric arm on each side of the CLK extends to present the seatbelts, making it easier to reach the belts.. The belt presenters retract once the belts are buckled. Love it!! You can tell this one was loved. The premium leather is in beautiful condition. The car is just super clean inside and out. You will not likely find another like it offered at such a low price. It’s a Mercedes so its totally loaded up, features include leather upholstery, dual-zone climate control with pollen and dust filter, 10-way adjustable power seats with three memory settings and rain-sensing windshield wipers. Burl walnut wood trim, Power Windows, Power Locks, Power Mirrors, CD/AM/FM Premium Sound System, CD Changer, Ice Cold A/C, Leather Wrapped Steering Wheel with power Tilt, Cruise Control, Etc.... Runs and Drives Fantastic, really a joy to drive. Mercedes-Benz’s motto is “The best or nothing at all” and this car lives up to the hype. Come by Today, You won't be disappointed!!! Drive Fun, Drive Safe, Drive Cool! Southern Auto Liquidators 1255 Belle Ave. Unit 131 Winter Springs, FL 32708 Phone: 407-960-5770 Get a well-maintained, competitively-priced, Used Car in Winter Springs at Southern Auto Liquidators. 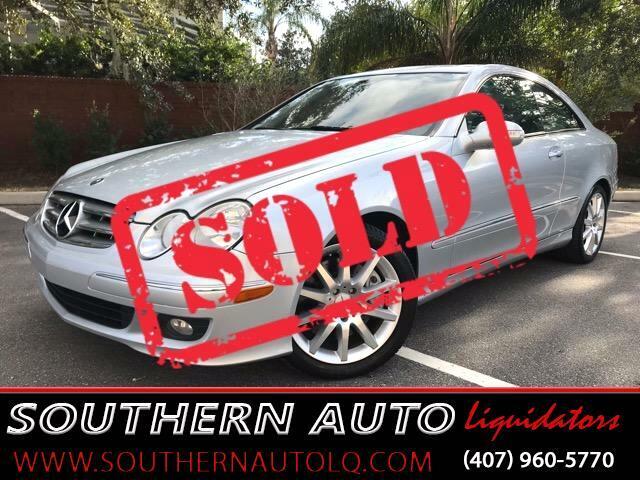 We hand select our Used Vehicle Inventory, to offer unsurpassed quality and value.GIVE US A CALL TODAY FOR YOUR PERSONAL APPOINTMENT... 407-960-5770.You will NEVER PAY DEALER FEES at Southern Auto Liquidators. We believe in giving you the highest quality vehicle for the lowest possible price. Give us a call or text, and we will be happy to calculate your total out-the-door cost. We Accept VISA, MasterCard, CASH, Debit Card . NEED FINANCING, WE CAN HELP, FINANCING IS AVAILABLE... GREAT RATES!!! We can also work with your bank or credit union, please visit your bank or credit union for financing information if you prefer to go through them. Visit Southern Auto Liquidators online at www.SouthernAutoLQ.com to see more pictures of this vehicle or call us at 407-960-5770 today to schedule your test drive. Message: Thought you might be interested in this 2007 Mercedes-Benz CLK-Class. Get a well-maintained, competitively-priced, Used Car in Winter Springs at Southern Auto Liquidators. We hand select our Used Vehicle Inventory, to offer unsurpassed quality and value.GIVE US A CALL TODAY FOR YOUR PERSONAL APPOINTMENT... 407-960-5770. You will NEVER PAY DEALER FEES at Southern Auto Liquidators. We believe in giving you the highest quality vehicle for the lowest possible price. Give us a call or text, and we will be happy to calculate your total out-the-door cost. We Accept VISA, MasterCard, CASH, Debit Card . NEED FINANCING, WE CAN HELP, FINANCING IS AVAILABLE... GREAT RATES!!! We can also work with your bank or credit union, please visit your bank or credit union for financing information if you prefer to go through them. Visit Southern Auto Liquidators online at www.SouthernAutoLQ.com to see more pictures of this vehicle or call us at 407-960-5770 today to schedule your test drive.